63 years have been passed as an independent country. We would like to greet our nation on 63rd birthday of Pakistan. HAPPY INDEPENDENCE DAY 2010. Once again, BrightSpyre at its best, introduces an exclusive offer on this auspicious occasion. Employers can advertise jobs on a very discounted price and can avail the benefit of state of the art recruitment system along with the powerfull pool of candidates. You can avail this exclusive package from 14th August till 14th September 2010. Job Posting for Rs. 500 per job. Unlimited Job Postings for Rs. 10,000, for 1 month. Advertise 100 Jobs for Rs. 40,000, for 6 months. 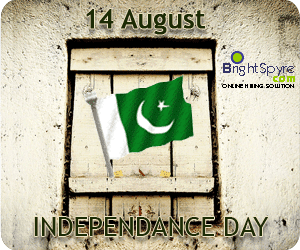 2010, August 2010, brightspyre, Discounted Prices, islamabad, jobs in pakistan, jobs islamabad, jobs karachi, jobs lahore, jobs sites, Offers. permalink.